With last weekend being Easter I thought I would relive my childhood and make the rice crispy treats I used to make every year with my Grandy. I'd totally forgotten quite how good they were, but beware... they are definitely not for anyone watching their waistline! Chop up the mars bars and melt in a bowl over boiling water with half the butter. It will curdle a bit at first but just keep stirring it until it goes nice and smooth and glossy, add more butter if you think it needs it. Mix the melted mars bar mix with as many rice crispies as it will cover! ... Depends how chocolatey you want them as to how many you add. Tip - mix in the warm bowl as it keeps the melted mixture soft and easier to stir, careful though it'll be hot! 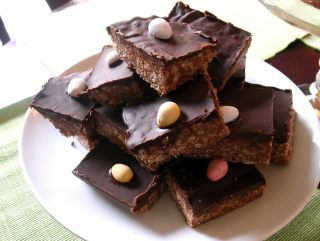 As it was Easter I put mini eggs on the top of my crispy treats as decoration but you don't have to do this, or could subsitute mini eggs for malteasers or minstrels or something else chocolatey and bad for you! Place the baking tray in the fridge for a few hours or until the chocolate has set then slice up and devour!